This was one of the first books I read as a child. I remember thinking that the world is not as scary as it might seem and that there were a lot of things to explore!!! It made me realize what my imagination is capable of!!! There, Max leads the creatures in a frenzied rumpus …..however, he soon grows tired of the chaos and decides he “wanted to be where someone loved him best of all,” so he returns home where he finds his supper waiting!!! 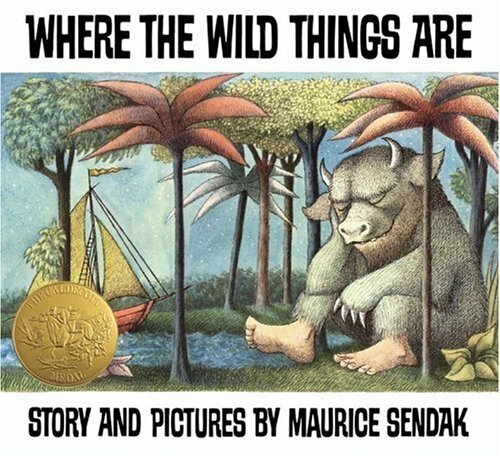 Sendak’s ability to capture both the bittersweet difficulty of young children and the warmth and loving care of parents made Where the Wild Things Are a bedtime favorite for millions of children. This entry was posted in Books and tagged book of the week, Maurice Sendak, where the wild things are by mia0909. Bookmark the permalink.